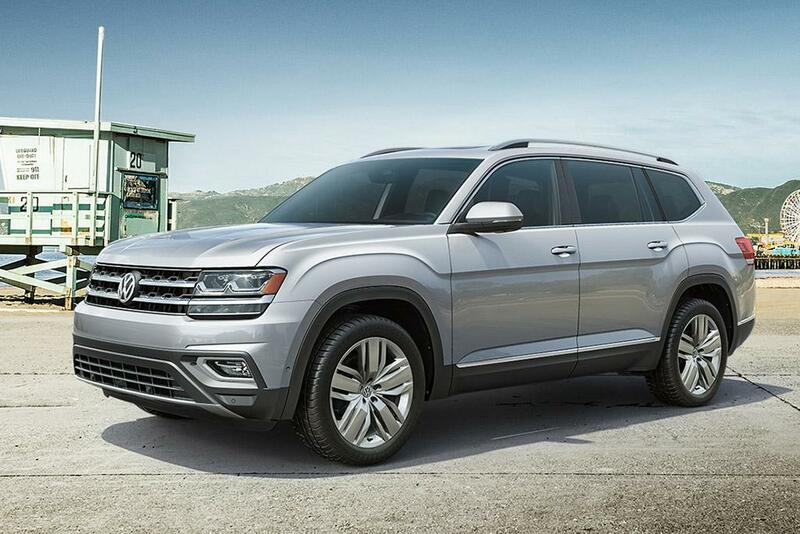 volkswagen is trimming the lineup for its atlas three-row suv, eliminating all but one four-cylinder version and axing the 2018 model's cheapest, front-wheel-drive v-6 version. it's also making modest price changes and adding some additional standard features, including standard safety tech for lower trim levels. for 2019, the turbocharged 2.0-liter four-cylinder, which only comes with fwd, goes from four available trim levels to just one: the base atlas s. four-cylinder versions of the higher-up se, se with technology and sel trims have been dropped. for 2019, the 2.0-liter s starts at $31,890 (all prices include a $995 destination fee), up $145. for the record, detroit bureau chief aaron bragman found the higher-mileage four-cylinder atlas "a perfectly respectable choice." also named the atlas our best of 2018 vehicle after it won our 2017 three-row suv challenge. you can find more atlas coverage, including reactions from our year of owning one, here. also gone is the 2018 model's least expensive v-6 variant, the s trim level with fwd, which started at $33,145. you still can get a 2019 model-year v-6 with fwd, but the least expensive way to do that now is in the se trim, which starts at a much higher at $36,490 (up $255 from 2018). that's also $1,400 more than the least expensive 2019 v-6 atlas with all-wheel-drive, an s trim level that starts at $35,090 (up $145 from 2018). the bottom line? if you want a nicer version of the atlas with the 2.0-liter used engine , or you want a cheaper front-drive version of the v-6 atlas, you'll need to strike now while you still can find 2018 model-year examples on dealer lots. as of today, has dealer listings for around 1,300 new 2018 2.0-liter se, se with technology and sel models. to give you extra incentive to move quickly on those 2018 four-cylinder models, vw is offering[mf7] qualified shoppers a $1,000 rebate and 1.9 percent financing for 60 months through halloween. the 2018 atlas s with a v-6 and fwd is more of a unicorn; just 114 are listed on nationwide as of this writing. while there are fewer configurations, the 2019 atlas will continue to have seven trim levels: s, se, se with technology, se with technology r-line, sel, sel r-line and sel premium. powertrains remain the turbo 2.0-liter four-cylinder (235 horsepower) and 3.6-liter v-6 (276 hp), each mated to an eight-speed automatic transmission. newly standard across the board is a frontal collision system with automatic emergency braking and a blind spot monitor with rear cross-traffic alert. all models also get standard automatic headlights, rain-sensing wipers and heated side mirrors. added features for other trim levels include three-zone automatic climate control for the se and the newly optional panoramic moonroof on the se with technology. meanwhile, the sel goes a little more upscale with a standard configurable instrument display, in-car navigation system, led taillights and a heated steering wheel. pricing for other 2019 v-6 atlas trim levels with fwd (add $1,800 for awd) are as follows: the se with technology starts at $38,290 (down $45 from 2018), while the se with technology r-line starts at $40,240 (up $55). the sel starts at $42,390 (up $255), and the sel r-line starts at $44,340 (up $245). however, the top-of-the-line sel premium, which has standard all-wheel-drive, gets a price cut of $345 to start at $49,390.